Dwarka is considered to be one of the 7 Mukti Stala pilgrimage centers of India and is located on the west coast of India in Gujarat on the extreme western tip of the Kathiawar peninsula. Nearby is Somnath, another prime pilgrimage centre of India. Aadhi Sankara established one of his four Peethams at Dwarka, the other three being Sringeri, Puri and Joshi Mutt. Legend has it that Krishna built the city of Dwarka as his capital with the aid of Viswakarma, after moving from Mathura. The Dwarkadeesh temple has a five storeyed tower supported by 60 columns. This temple is known as Jagat Mandir and is believed to have been built by Sambha the grandson of Krishna. Visitors enter through the Swarga Dwar and exit through the Moksha Dwar here. The Rukmini temple here is believed to be 1600 years old. The Gomati Sangamam where the river Gomti reaches the sea is located close by. A little north of Dwarka, one can ferry across to Bet - Dwarka island where Kuchela is supposed to have lived and where Krishna killed the demon Shankhasura. There are shrines to Rukmini, Trivikrama, Devaki, Jambavati, Lakshmi Narayan and other deities here. There is another temple to Rukmini, believed to be the site of Krishna's marriage with her. Archeological excavations have revealed five earlier cities here. Thirudwarakai is situated on the Bombay Ahmedabad route.. The first one is very important and very popular. The Moolavar of this Dwaraka divyadesam is Kalyana Narayanan. 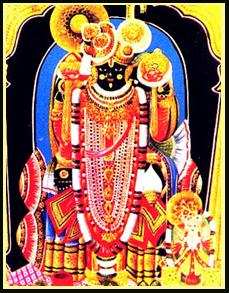 He is also called with the names as Dwarakadesam and Dwarakanathji. Prathyaksham for Droupadhi, Kuchelar, Sathyabama, Rukmani, Arjunar etc. Moolavar in Nindra Thirukkolam facing his thirumugham towards west direction. This Divyadesam is found on Bombay-Oka port rail line. To reach this Temple, one has to travel via Ahmedabad, Rajkot and Jam Nagar. Dwaraka railway station is 20 kms away from Oka port and from there we can reach the Temple.